Hillsboro’s Braylynn Haines shoots from the corner inside Grandle Gymnasium on Thursday at Fairfield High School where the Lady Lions battled the Fayetteville Lady Rockets in a SHAC girls varsity basketball matchup. LEESBURG — Following a 10 day break from games the Fairfield Lady Lions were back in action on Thursday as they hosted the Fayetteville Lady Rockets. The Lady Lions started out well and led after the first quarter by a score of 21-17 but were unable to maintain the offensive output as Fayetteville forced a staggering 42 turnovers to come out on top 64-60. Fairfield took the lead early in the first quarter when Brianna Barnes scored the first six points for the Lady Lions as they jumped out to a 6-2 lead. Fayetteville responded with seven of the games next nine points to climb within one point of Fairfield at 8-7. From there the teams traded baskets until Samara Cannon hit a three pointer and converted two free throws from the charity stripe to push the Lady Lions’ cushion to four points at 17-13. Fayetteville responded with four straight points before Braylynn Haines hit a jumper to provide the Lady Lions with a 21-17 lead after one quarter of play. Fairfield was able to push its lead to six points at two different points in the second quarter but the Lady Rockets used an 11-5 run over the last 2:26 of the first half to tie it at 33-33 heading into halftime. Fayetteville grabbed the momentum coming out of the locker room with a 12-2 run as the Lady Lions struggled to bring the ball up the court in the opening minutes of the third quarter. 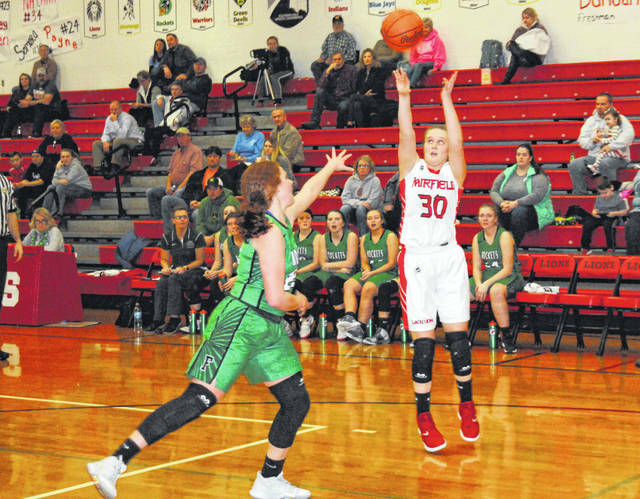 Fairfield totaled seven points in the third while the Lady Rockets put in 18 and took a 51-40 lead heading into the fourth quarter. The Lady Rockets maintained control for much of the fourth quarter and led 60-49 with 1:54 to play in the game. The Lady Lions scored 11 points over the final stretch which included three three pointers by Cannon but ran out of time at the end as they fell 64-60.